For those of you that know me well, you’ll recall that my kids have always struggled with separation anxiety. I like to tell myself it’s because I’m a much better option than going to school, but in reality I suffered exactly the same debilitating level of anxiety as a child, each time I had to leave my Mum. Laura is now 6, and so for 6 long years, the mornings she’s gone to either preschool or school, have been filled with, something between, a low level protest, and an all out tantrum. Some mornings, a very public tantrum at the bus stop… Yes, I’m that Mum! After wracking my brain for a solution (I teach wellbeing strategies for goodness sake) I’ve come up with a 30 Day Kindness Challenge. We completed the Kindness Advent Calendar in December, which I founded, and the kids loved it. We often do random acts of kindness, but lately it seems to have dropped off the radar and I thought, perhaps focusing on others might help shift her anxiety. Laura has also recently stated that she want’s to be a “You-Tuber” so what a great opportunity for her to get started! LOL. Day One – We started with their favorite activity of all, dropping off a box of chocolates. This time we went to the Lake Illawarra Police Station with a simple thank you note and gave them a box of favorites. It was a great start, and certainly had her talking about it all evening. The Police were extremely surprised and grateful and the external focus began. Day Two – Laura decided to teach her brother some maths and words with puzzles before school. Remarkably, this morning was the first morning all term that we haven’t had issues with getting dressed and ready for school? Coincidence? Is kindness a clinical cure for anxiety? Not that I’m aware of, but on day two I’m seeing some pretty promising signs, so stay tuned! Over the school holidays we’ll be blogging and putting our pictures, ideas and videos up on social media, so be sure to check out both www.facebook.com/JodieCooperPtyLtd and www.facebook.com/kindnesscrew. 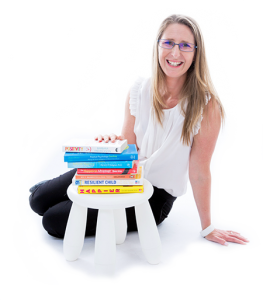 If you’re looking for some help with bringing positivity into your life or business drop me a line below, I’d love to help. PreviousPrevious post:A peek into my life – Positive habits for productive peopleNextNext post:The Happiness Pie – Have you got your share? Get “18 ways to become more positive, engaged & productive” in your inbox now.